Click the button below to add the Recycled bombshell long spoon handmade in Laos to your wish list. This very special spoon is made from recycled bombshells (safely sourced). During the Vietnam War, Laos was heavily bombed. 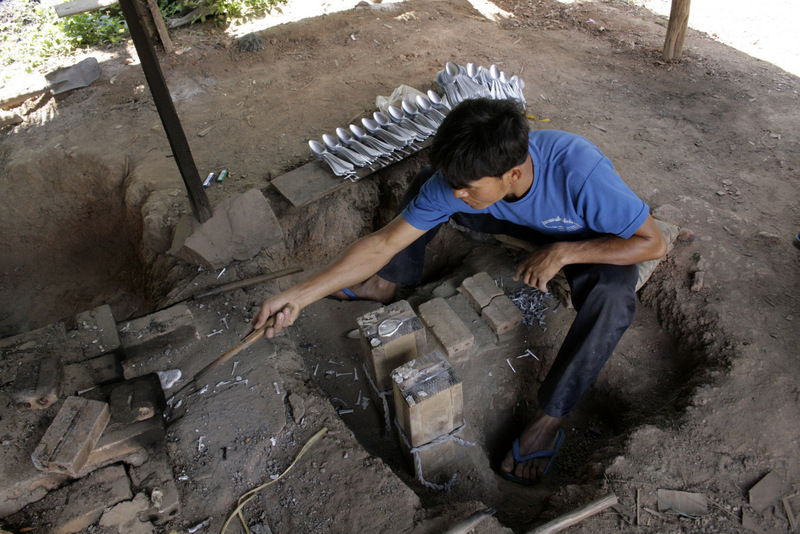 After the war, the local artisans turned bombs into spoons and fed their families. Since then, they have been transforming objects of violence into objects of beauty and functionality, which gives each spoon a powerful message of peace. There are very few products in the world that have quite such a story to tell. This spoon embodies how fair trade production goes above and beyond standard manufacturing on so many levels: from empowering the rural poor to recycling materials, to utilising traditional artisan skills and – what this product does best – raising awareness about global issues. Saoban is a non-profit organisation in Laos that operates under fair trade principles and works with many remote villages. Learn more about recycled bombshell products. Note: even though aluminium is safe to use with food, this product is intended to be decoration only. The name of the person who made this product is Mr. Sone, he lives in Napia village, Xiengkhuang province, Lao PDR.